The world of laser technology is being refined to promote faster healing on a cellular level, which is great news if you have soft tissue problems in your feet and ankles. As well, new laser technology is allowing doctors to quickly address fungal infections in your toenails. Under the expert guidance of Joseph R. Disabato, DPM, and Melissa L. Gulosh, DPM, Virginia Foot & Ankle Surgical Associates offers the latest laser technologies, including the MLS laser and the CoolTouch Varia Breeze®. For more information, call or use the online scheduling tool. MLS, short for the multiwave locked system, is an FDA-cleared laser technology that relies on light energy (photons) to heal your tissue and reduce your pain and swelling. The light energy penetrates your damaged cells, without harming the surface area, and stimulates healing and repair. The light energy stimulates intercellular activity in your tendons, ligaments, and muscles, which speeds up the recovery of your damaged cells. The MLS laser is different from the previous laser treatments because it uses two wavelengths. Until now, doctors have used pulsed light lasers to control swelling and continuous light lasers to control pain. MLS therapy allows your doctor at Virginia Foot & Ankle to do both as the MLS laser induces strong anti-inflammatory, anti-edema, and analgesic effects simultaneously and within a short period of time. 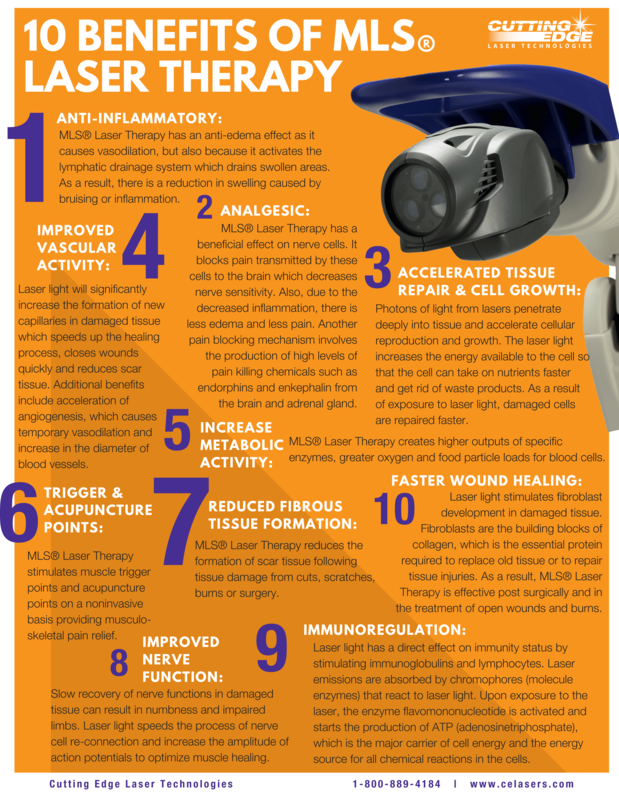 What conditions can the MLS laser treat? Since the laser treatment is noninvasive, the doctors are able to use the MLS therapy on most foot and ankle concerns that involve your soft tissue. Most patients require 6-10 treatments, which are very fast — usually just 8-20 minutes each. Since the laser treatments are noninvasive and pain-free, there’s no downtime afterward. What is the CoolTouch Varia Breeze? If you have a toenail fungus that’s slowly turning your nails into a yellow, crumbly mess, the doctors at Virginia Foot & Ankle offer CoolTouch Varia Breeze. This system sends laser energy into and through your nail, as well as your surrounding skin, to target the fungal organisms below. The laser causes heat damage, which kills the fungus. Once the doctor destroys all of your fungal organisms, your toenail is able to grow out normally. It typically takes only one treatment session to kill the fungus in your nails, and then you can enjoy new growth that’s free from the fungal infection. If you’d like to explore your options in laser treatments, call Virginia Foot & Ankle Surgical Associates or use the online scheduling tool.